I heard the news late last night and I was deeply shocked. My world came crashing down as much of a clishe as it may sound. I cried until there was nothing left of me and felt completely numb. I listened to LP for hours until the news started to sink in. 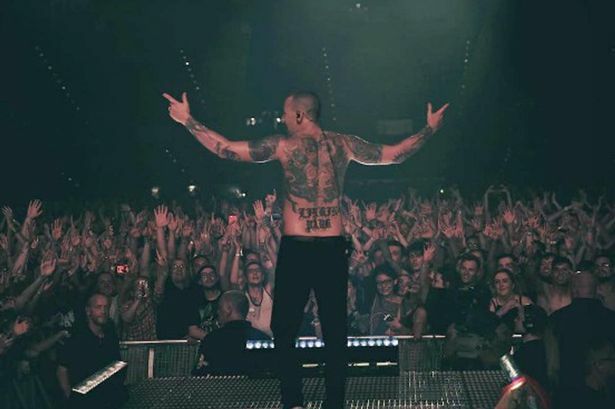 I can't say I necessarily wanted to write this post about Chester Bennington and his death, but more felt the need to, as he has been the greatest idol alive in my lifetime for me, personally. I thought to tell you guys about my relationship to Linkin Park, Chester, and the music, but the more I think – or listen how I feel about it, - the more I feel I need to also write about his death. Just said in an interview exactly one month ago that my biggest dream as a photographer and a rocker soul is to meet Chester face to face and have his pictures taken. To me meeting him personally has been a lifelong dream and since I've started photographing it added the layer of getting to photograph him. All of our dreams won't come true and very sadly, this is one of them for me. I'm glad I got to experience Linkin Park live 3 times, and will forever carry those memeories with me, going back and back again and again. The music never dies. But to be honest it has never been just about his music, it's the story of him. It's the message of him, it's between the lines and in his lyrics. We can hear the open struggle, with pain, lots of fear and uncertainty. But in addition there was the side of hope and bravery, and that is what he gave to so many of us. The strenght to deal with our own struggles and the power to go on. I've never listened to LP without hope or the feeling of empowerment. Not even at my hardest times, and not even those hardest and most saddest songs; they have a message of hope and have helped so many during the LP years. Chester's death is a huge loss, and a personal loss to many, including me. There's nothing glamorous in suicide and it should not even be an option. In a perfect world, it wouldn't be. But our world is far from perfect. "IT HAS NEVER BEEN JUST ABOUT THE MUSIC, IT'S THE STORY OF HIM." If you take a look at his life, particularly the bright sides of his life like his children, wife, career and success, if even your family can't eventually make you stay it must tell us the cuts are deep and the bourden too heavy. Family, friends, fans and success can bring happiness to a person's life but does not quarantee a lifetime of happiness to any, and most certainly does not erase the past. Love and family are not an assurance for nothing bad ever to happen and can not completely take away your traumas. What I know, is that Chester was a broken man, and he was already broken in his childhood. The damage that's been done, things that happened to him and altered him in his early years, got to be too much at this stage of his life. No one in their right mind would make a desicion like this lightly and we must realise this kind of pain is real and there are people who can't find their way out. Chester was abused as a child. He carried the shame with him all of his life and that abuse started the vicious circle of drug and alchohol abuse. No matter the love and success that came after, once you've been broken down and even if you get better, you can never be fully fixed. Once something like this happens to you, and not even once but many times, you can not be or feel complete again. And I wish it wasn't so. There are no guarantees in life, but Chester gave it his best shot and what he gave to us is something to be deeply grateful. What happened does not erase the fact that he did found the strenght to carry on for so many years, he made it this far, to the age of 41. And you can not erase someones achievements, impact and legacy just by the way he passed on. "NO MATTER THE LOVE AND SUCCESS THAT CAME AFTER, ONCE YOU'VE BEEN BROKEN DOWN AND EVEN IF YOU GET BETTER, YOU CAN NEVER BE FULLY FIXED." Sp should we have more open discussions about mental health problems and struggles? Yes. Should we focus on preventing those problems and drug abuse for example? Yes. Are we in any position to judge anyone who's final decision is to take their own life? No. It's naive to think that we would have enough knowledge, and the best we can do is to try to understand what led to this and learn from it, and to be human to eachother. There will always be peolpe who are ignorant and arrogant in discussion about mental health, battles of addiction and the consiguences of an abuse. I don't take their arrogance personally, it simply saddens me. What needs to be said is that we have to stop abusing and hurting other people. The world can not take these stories, we can't deal with these kind of losses. We need to take care of eachother, take care of our friends and especially our children, as the things we experience in our childhood can either make or break us. You can never fully recover from a nightmare. And to people who do not understand depression and struggles of these kind, please try to educate yourself. If there's something you do not understand it does not mean it doesn't exist. Depression exists. It's alive and well, and ever growing and ruining people's minds, bodies and lives. Depression is a terrible desease that can eventually take your life. To Chester. I just hope you had a life you never could have even dreamed of. Your family, career, fans all around the world, friends and bandmates. You were a blessing, you were a gift to mankind. I will remain a huge fan and will not condemn your desicion. You will be deeply missed.